The Panda Ball Python is a combination of the co-dominant Black Pastel trait and the recessive Piebald trait. Also known as a "Super Black Pastel Piebald", we consider this variety to be among the most stunning of Ball Python morphs. The intense black and white color combined with the pattern variability of the Piebald gene trait enables an unlimited number of unique Pandas. There are several genetic combination pathways that can lead to producing a Panda Ball Python. 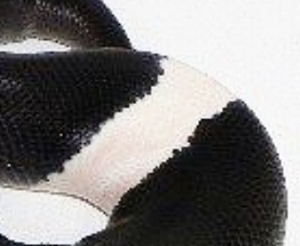 The "Super" form of the Black Pastel Ball Python (Black Pastel x Black Pastel) is an all black Ball Python, and when this is combined with the Piebald trait, a Panda is born. Panda pairing = all Pandas!